Spain appears to be heading towards an evolved party system in which the big players will be now four, not two. 2015 will be the year in which the powerful emergence of recently-funded new political actors will get translated into parliamentary seats. In times of accelerating change, the a-synchronicity between current public opinion and elected representative bodies grows. The former has to do with present reality while the latter reflects a reality of the past, when the elections were last held – and it seems such a long time ago. This gap, a common end-of-term phenomenon affecting parties in office in all liberal democracies, becomes a systemic risk factor when it widens beyond moderate boundaries, separating the views of the public from those of the main parties – in government and in the opposition. It is then a measure of citizen disaffection. This is particularly so in places such as Spain today, where the mandatory austerity measures have been applied with particular harshness by the local branch of the European People’s Party, producing a major social emergency. According to the European Anti Poverty Network (EAPN), 12.8 million Spanish citizens (out of a population of 47 million) are now facing relative poverty and social exclusion, up 27.3% since 2010. According to EUROSTAT (2012), more than one in three Spanish children (33.8 %) is living at risk of poverty or social exclusion (EU 28 = 28.0 %). And according to the OECD, over the last seven years inequality has grown at a far quicker pace in Spain than in any other member country (including Greece and Portugal), so that Spain is now heading the European ranking, second only to Estonia. This is where Podemos and other new political actors come into play, to the effect of shattering the intellectual safety of the established two-party system and doing away with the received wisdom regarding the ineluctability of the law of the pendulum. The situation is such that today political prospective has become a particularly tricky business in Spain while being, at the same time, in high demand. This has resulted in an unprecedented opinion-poll craze in the country. This is indeed the Year of the Polls: early regional elections in Andalusia in March, local elections in the whole country plus elections in thirteen regions in May, already-announced early elections in Catalonia in September and general elections in December at the latest. It is also the Year of the Sociologists, modern-day oracles who are currently enjoying a kind of pre-election spree. The findings of the multiple surveys which they are conducting, percolated through the mainstream media and much talked about in the social networks, feed into the playful/manipulative speculation that Spanish citizens have come to accept as being part of their everyday life. The fact that the two top Saturday night prime-time shows on national TV are political debates comes to prove that in Spain political entertainment is now in season. What are the opinion polls saying? There are several independent institutes and bodies (among them: Metroscopia, Sigma-2, Invymark, Celeste-TEL, Simple Lógica/Gallup) devoted to conducting opinion surveys in Spain, which are typically commissioned by news organizations and political parties. All the main newspapers, radio and TV networks regularly publish their own observatorios (observatories), termómetros (thermometers) or barómetros (barometers), while parties usually keep theirs to themselves, unless they choose to use them as sounding balloons in their campaign strategies. The generally though not uncritically accepted reference, however, is the quarterly survey by the Centro de Investigaciones Sociológicas (CIS – Sociological Research Centre), attached to the Ministry of the Presidency, the latest edition of which was published on February 4. They all tell a tale of change: nothing in Spanish politics will ever be quite the same. Moreover, from now on things could be completely different. The problem, though, is how to measure the extent of the drift, a measure that is made all the more difficult by the unprecedented volatility of the voters: the undecided account for up to 20% of the electorate and those who say they will abstain between 27 and 30%. These figures indicate not only the spread of the soul-searching and disenchantment among Spanish voters, but also the inconclusiveness of the projected election results, clearly closer to an informed guess than to a reliable forecast. In these circumstances, it can be fun to indulge in oracle reading, but the far from conclusive figures also undoubtedly generate much unrest and anxiety at the established parties’ headquarters, prompting them to launch attacks on their competitors with anything on hand – which is precisely where we are at the moment. The first opinion poll that pointed to a Podemos victory at the forthcoming general election was Metroscopia’s in November 2014. This lead has since then been upheld by at least thirteen other surveys. In the same period of time, the governing People’s Party came first in up to nineteen other opinion polls, and the Socialist Party in only one. The People’s Party, which enjoys an overall majority in Parliament since its landslide victory in 2011 as a result of the voters’ initial reaction to the crisis, which was then blamed on the outgoing Socialist government of José Luis Rodríguez Zapatero, is now assigned between 20 and 27 percentage points in voter preference (down from 44% in 2011). Even if it were to come in first at the actual polls in December, it would be forced to seek one or two coalition partners in order to hold office, which is something Spanish political parties are not at all used to doing. The other side of the two-party coin and currently the main opposition party, the Socialist Party (PSOE), is not cashing in on its arch-rival’s difficulties and gets only between 19 and 23% of the voters’ preference. The relevant datum here is that the two parties that have governed Spain in the last thirty years do not exceed 50% of the projected popular vote, which is clearly the end of the world as they knew it. One of the very first consequences of this situation is that any temptation some may have had to give a German-like Grand Coalition a try (an option that is rejected by three out of four voters) must be hastily shelved. What comes out strongly from the opinion polls is that this is the time of the newcomers, Podemos and Ciudadanos, which are powerfully emerging as two leading actors in Spanish politics. Both are growing at the expense of all the existing political forces (mainly at the expense of the left-of-center parties in the case of Podemos, and at the expense of the party to the right of center in the case of Ciudadanos). It should be noted, however, that all the projections for these new political actors suffer from the fact that the polling data are technically very difficult to “cook” in their case, for they lack a voting record. Much has been said already about Podemos’s and its charismatic leader Pablo Iglesias’s meteoric rise and its success at catalyzing the Spanish citizens indignation at the austericidio (austericide), which means the way in which austerity measures have been carried out by the People’s Party. 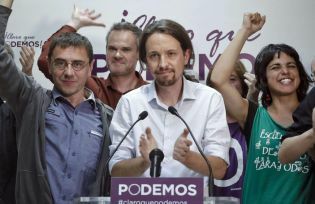 Podemos reaps, according to the opinion polls, between 24 and 31% of the popular vote and becomes not only the leading party of the Left but also, possibly, the main party in the country – quite a feat, considering it was only founded on January 16, 2014. Campaigning for “The Sensible Change”, Ciudadanos has been growing at a very fast pace too, from being a regional party in Catalonia to becoming a leading actor in Spanish politics, with more than 18% of the vote according to the very latest polls. Interestingly, the vote for Ciudadanos, the appeal of which is based on its corruption-free record and its regenerationist stand, is being interpreted as a safe protest vote that does not question the System – the ideal proposition for disenchanted People’s Party voters. It represents somehow the comeback of a centrist option in Spanish politics, some thirty years after the predecessor of the People’s Party, Alianza Popular (AP – People’s Alliance) gobbled Adolfo Suárez’s Unión de Centro Democrático (UCD – Union of the Democratic Centre), the party that piloted the transition from dictatorship to democracy. Trailing far behind the four leading parties are to be found the red/green Izquierda Unida (IU – United Left), with some 5% of the vote, the expectations of which have largely been depleted by Podemos; the middle-of-the-road Unión Progreso y Democracia (UPyD – Union Progress and Democracy), with some 4% of the vote, heavily penalized by Ciudadanos’s emergence; and the right-of-centre Catalan and Basque nationalist parties, which have historically used a strategy of coming to the aid of any national party in government in need of a handful of votes in Parliament in exchange for some spoils, with a meager 3 and 1% of the vote respectively. Spanish voters will be called to the ballot box in the forthcoming months and their vote might not please Herr Wolfgang Schäuble, the German Minister of Finance who dared say that Greek citizens who gave Syriza a majority in Parliament at the last elections had voted “irresponsibly”. Until then, though, what opinion polls are indicating is an unheard-of volatility of the electorate at this point in time. Some observers argue that these are times of great uncertainty. But however imprecise in their findings, opinion polls are all adamant in describing the drift apart from the established parties, which voters hold responsible for the present state of affairs and blame them for their inaction first and their nefarious, ideologically-driven austerity measures later, in addition to their collusion with the economic powers that have benefitted from “the crisis”. What is expected in 2015, in short, is the verification of the crumbling of the two-party system – or systems, for the very same applies at the national, regional and local levels. 2015 will be the year in which the powerful emergence of recently-funded new political actors will get translated into parliamentary seats. They are fueled by the outcry which the Indignados’s movement first displayed against what they saw as an attack from the System, by mass mobilization against the dismantling of the welfare state and the deep, across-the-board repulsion for corruption, both in the public and business spheres, which has surfaced through a long chain of financial scandals: the unwanted inheritance of the undemocratic ways of running things which were the rule under Franco and which the much-celebrated Transition of thirty-five years ago not only failed to eradicate but consented to preserve. Spain appears to be heading towards an evolved party system in which the big players will be now four, not two, with the People’s Party and the Socialist Party fighting a close battle with two powerful newcomers, Podemos and Ciudadanos. An extraordinary political scenario is unfolding, one of a fragmented parliament in search of an unprecedented coalition government. Volatility and fragmentation: this much can be said. The actual figures include far too large a margin of error to be of much serious use beyond TV shows or as ammunition during the forthcoming campaigns. But today, the combined effect of the opinion polls and the perceptible restlessness of the old parties certainly makes life in Spain quite interesting. Oleguer Sarsanedas is a writer, editor, journalist and former director of Catalunya Ràdio.